The HDD score is disappointing. The HP Mini 1000 that I have has a 16GB SSD, and that should be at least as fast as a standard 1.8 inch HDD, but it scores pretty below that level. Not too bad otherwise considering the price of the hardware, and the build quality of the unit, but it is still kind of sad that my UX180 scores slightly better than this, is much smaller, and gets about the same amount of battery life. Sure, the UX180 was really expensive when it came out several years ago, but today you can buy one for a similar price as the HP Mini 1000. The Mini 1000 is definitely targeted as a secondary computer. I find that it works well as an around-the-house computer for staying connected through social networks and doing light web browsing. Welcome to this week’s netbook roundup. In this space every Monday I’ll highlight netbook news items that might not need their own individual posts but may still be interesting. Black Samsung NC10 now shipping, slightly cheaper â€” The slightly modified black Samsung NC10 [Portal page] with larger trackpad is now shipping and can be bought for less. 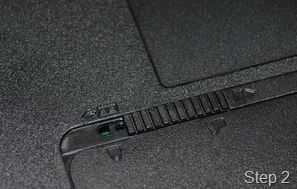 Dell Inspiron Mini 10 Review â€” Laptop Mag reviews the Dell Mini 10 [Portal page]. “Dell’s first 10-inch netbook has a compact chassis, good keyboard, and a crisp 10-inch display, but we wish it offered better battery life for the price”. 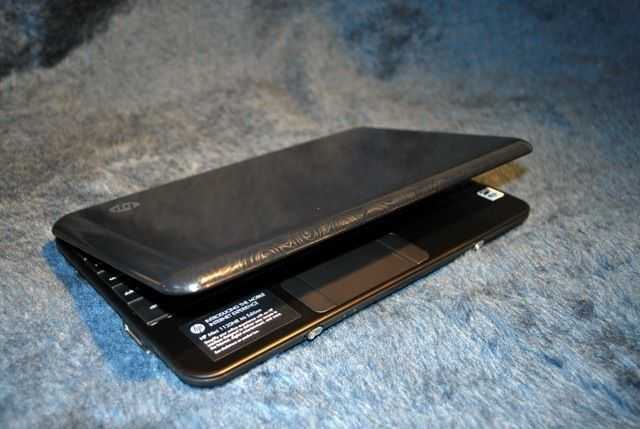 New Acer netbook hits the FCC web site â€” Looks like there might be a different new Aspire One 10″ netbook in the works. FCC docs give a few hints. 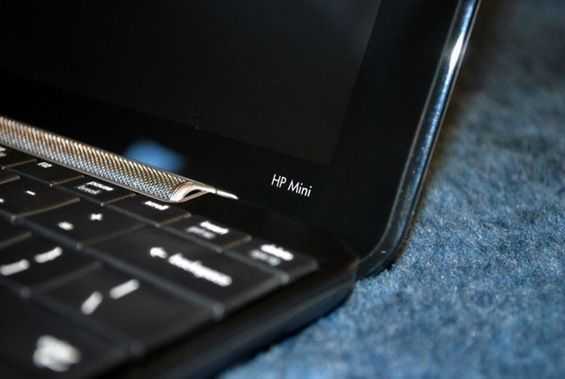 HP Now Offers Extended Battery for the HP Mini 1000 â€” HP has released the extended battery for the HP Mini 1000 [Portal page][Review]. It will run you $119. First look at the Eee PC 1008HA’s Eee Dock app – Video â€” The upcoming Eee 1008HA has some Asus built software that gets demoed on video at CeBIT 09. I’ll be doing a review for the VAIO P [Portal page] which we recently received from Dynamism for testing. This will be in a rolling-review format as we’ve done with the HP Mini 1000 MIE. Here is a roadmap that I’ll stick to when covering the VAIO P, and each section of the review will be released incrementally over the next few weeks. The unboxing post is already up and linked. I’ll retroactively link in each section as they go up as well, so make this post your home for our VAIO P review as it progresses. Welcome to this week’s netbook roundup. In this space every Monday I’ll highlight netbook news items that might not need their own individual posts but are still be interesting. Dell Mini 10 dissected — Dell support released a guide for disassembling the Dell Mini 10 [Portal page]. Looks like there are some PCI-e slots which will be good for modding, but RAM is soldered to the mobo which will make it very hard for users to do RAM upgrades. 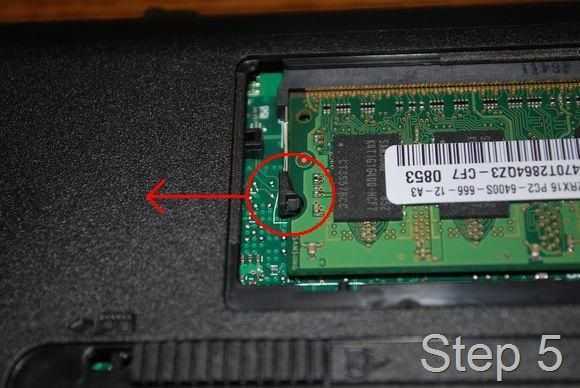 HP Promises a Fix for Mini 1000 Webcam Woes — HP acknowledges that there is an issue with the HP Mini 1000’s webcam and says that there will be a method to fix it. Apparently the film over the webcam has a lower reflectivity than it should. Gigabyte M1022 netbook has a cool dock — Jkk shows us a pretty slick looking dock for the Gigabyte M1022 which has VGA out, USB slots, and some other ports. It’s nice to see a dock for a netbook, but I hope the base is heavy so the netbook isn’t easily knocked over! Dell Mini 10 Netbook Officially Available: $399 — The Dell Mini 10 becomes officially available in the US for $399. 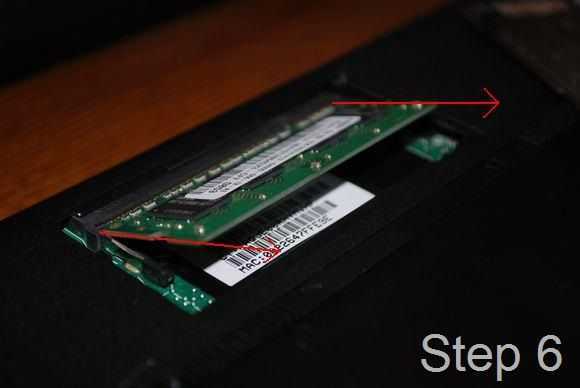 How to fix the dark webcam on the HP Mini 1000 — Liliputing links us to a new video (after the one taken down) that will show you how to remove the film over the HP Mini 1000’s camera, improving brightness. First look at the new slim Acer Aspire One — It looks like Acer is planning yet another 10 inch Aspire One, despite the fact that their latest update has just recently been released. I’ve just finished up the last section of the Mini 1000 MIE review. The review was done in rolling format, so each section came out at different times over the last few weeks. This post serves as a hub to access all of our Mini 1000 MIE review articles as well as any additional Mini 1000 MIE coverage that we put up while testing the unit. 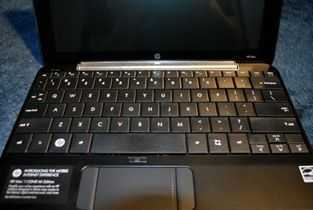 The HP Mini 1000 MIE is a good choice if you are looking for a netbook. 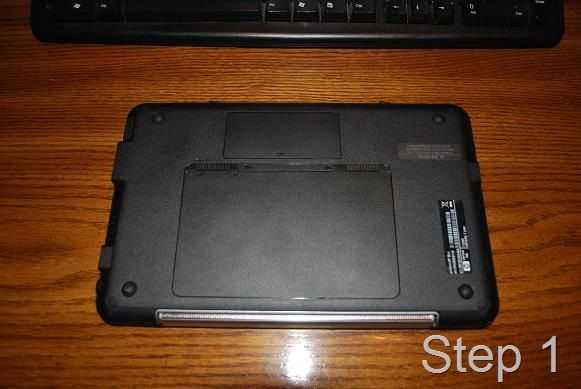 Wonderful hardware design and a very reasonable price make this netbook a respectable piece of machinery. It is important to keep in mind that netbooks aren’t as powerful as normal laptops, but the Mini 1000 MIE will work well for those that need a web browsing and light productivity tool, and want it to be small and portable. The Mini 1000’s keyboard is large and has been very well received. 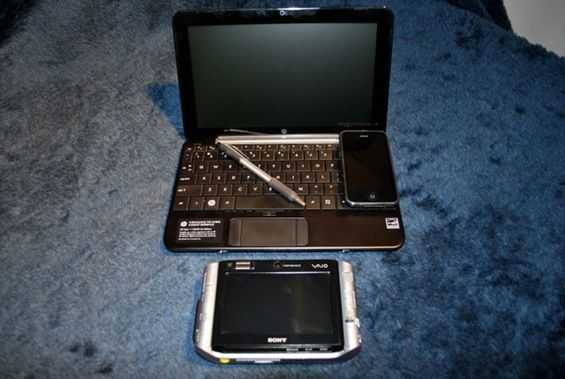 The unit itself is very small and light, especially considering the size of the keyboard and screen on it. The only issues you might have with the HP Mini 1000 MIE is that the battery life is not particularly good, around 2 hours and 35 minutes from a full charge (brightness max, Wifi on). A 6-cell extended, albeit ugly, will be available soon to push the battery life up around 5 or so hours. The other problem may be compatibility with the custom Ubuntu OS. While the OS itself works fine for most tasks, many people are used to Windows and might not want to change their computing habits to conform to the different OS. Luckily for you, it is always an option to put Windows XP, or any other OS on it, yourself, or buy the XP version from HP if you’d rather have it done for you. 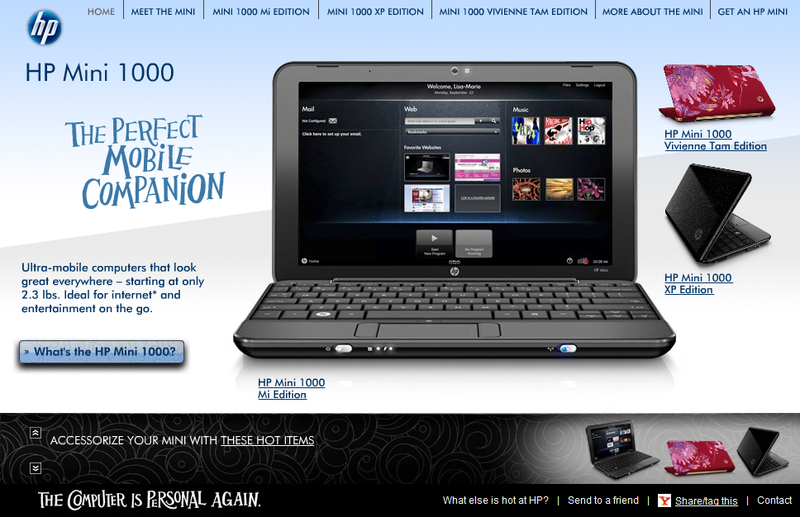 Check out the coverage below to get a detailed idea of the HP Mini 1000 MIE netbook. If you are interesting in buying an HP Mini 1000 MIE, or other version (like XP) head over to the portal page to get a full summary of specs and links to places that you can purchase the unit. Who is the target audience for the HP Mini 1000 MIE? I think I definitely saved the best for last. The HP Mini 1000 is a beautiful unit by anyone’s standards. Combine that with the fact that you can buy a version of the Mini 1000 MIE direct from HP starting at $280, and you should be impressed. Left (left to right): A/C plug, USB 2.0, vents, HP accessory connector, standard headphone jack, ethernet port (covered by rubber flap). 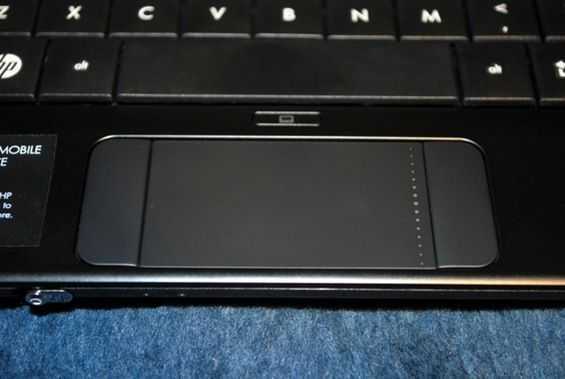 Front: Power slider, HDD/battery LED indicators, wireless slider. Right: SD slot, USB 2.0, recessed USB 2.0 (under cover). Back: Nothing here but hinge. Close up of the ethernet port under the rubber cover. It has definitely been an interesting testing experience with the Mini 1000 MIE [Portal page]. 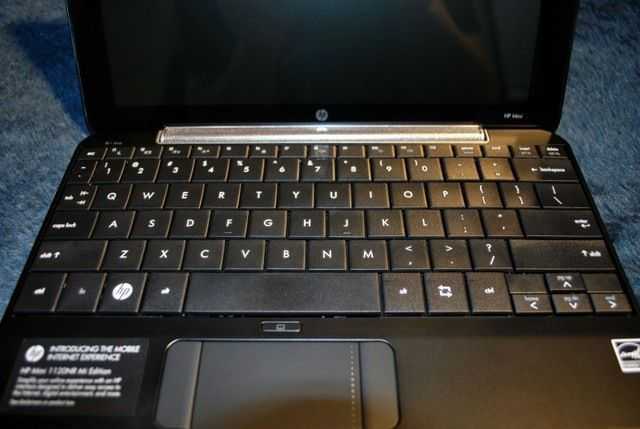 The netbook, as you have probably read, runs a custom Ubuntu interface designed by HP. They call it the Mobile Internet Edition of the Mini 1000. I am anything but a Linux pro, so I approached this as a newcomer to Linux. Luckily, HP is marketing the Mini 1000 MIE to less experienced computer users and not Linux pros. I gave you my initial software impressions not too long ago, but I’m ready to give you some more detailed information. Where to start…. 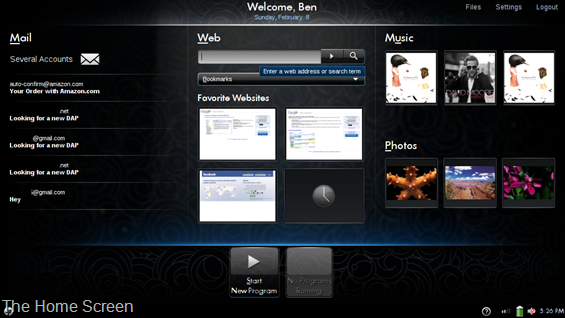 The home screen, as we’ve showed you before, does a good job of simplifying the computer experience down to some of the most commonly used activities on a computer. There is easy access to email, web, and photos/music. I have some issues with the home screen though; it seems like it could be set up to make people a bit more productive. My biggest issue is the photos/music section on the right side of the home screen. For some reason this is really unappealing to me. It shows the album art of the last three songs you have played, or the last three photos in your photo library. All it functions as is a shortcut to my photo or music library. Do I really need to have that 1/3 of my home screen experience taken up by the last three photos I put into the library? For some reason it just doesn’t sit right with me, I have no need to say “Hey look, those are the last three photos I took”. If I want to look at my images, I will actually go look at them, looking at thumbnails of the last three that I happened to take really doesn’t do anything productive for me. I want dynamic information displayed in this extra space that is actually useful. You can squeeze shortcut button to my photos or music somewhere else on the home screen, but it seems like something else in this 1/3 space would be much more beneficial. One of the things I have considered would be weather. It would be really cool to see the current weather, temperature and, the forecast for the next few days. How about severe weather alerts too? Another idea, which could even be in addition to a weather section, would be some stocks. It would be nice to see some graphs of different stocks which could be customized by the user. Of course you could always p00 pull down some recent news from a major news website. This is the kind of dynamic information that I feel would be much more useful in this space rather than simply showing me the last three pictures I took, or the last three songs I’ve listened to. The Web section of the home screen gives you a URL bar to reach any page, a drop down list of bookmarks, which aren’t easy to navigate if you have a lot of them, and four customizable squares that act as shortcuts to your favorite sites. It would be nice if each of the four site shortcuts had titles so you could see exactly what you were looking at. You can see small thumbnail previews, but all four of my boxes were filled with Google services, and every thumbnail was the Google login screen, I basically had no idea which site I was going to. The Mail section of the home screen seems good in theory. There is a list of messages from your inbox right on the home screen. Mozilla’s Thunderbird is the application that makes all of this happen, and clicking on one of your messages in the inbox list will launch the application. I tried setting up Thunderbird using the automatic configuration of a Gmail address but it hasn’t worked correctly for me. It wanted to set up a POP connection to my Gmail account and it downloaded some very old emails for some reason. To be honest, I didn’t dig down and properly set up my email with Thunderbird for two reasons. The first of which is that I didn’t want to accidentally download a bunch of emails to the Mini 1000 and mess up the organization of my Gmail inbox. The second reason is that a target Mini 1000 MIE user should not have to dig through configuration options to make their email work, especially if they already specified that they have a Gmail account (it should know how to set it up correctly for them, given the proper credentials). I trust Thunderbird as a reputable email client to be able to be configured correctly for any email account that supports POP or IMAP, but the point remains that it shouldn’t be up to a target Mini 1000 MIE user to have to figure out how all of those ‘behind the scenes’ preferences work. I’ve been testing the HP Mini 1000 MIE [Portal page] netbook for a few weeks now and I’m ready to give some performance information. As you’ll recall, the ‘MIE’ in Mini MIE stands for Mobile Internet Edition. This is HPs way of denoting their custom Ubuntu operating system which runs in place of a typical Windows OS. Unfortunately, because of the OS on the unit I can’t bring you the typical benchmarks. Luckily some benchmarks are already available out on the web from the XP versions which should give you a rough idea of what you will see, and I’ll point you in their direction toward the end of the post. What I can bring you however are some good old fashioned numbers (and maybe a chart or two)! Video playback within a web browser usually isn’t considered a big deal on a desktop computer, but when working with the relatively small resources of a netbook, it can become a bit more serious of a task. 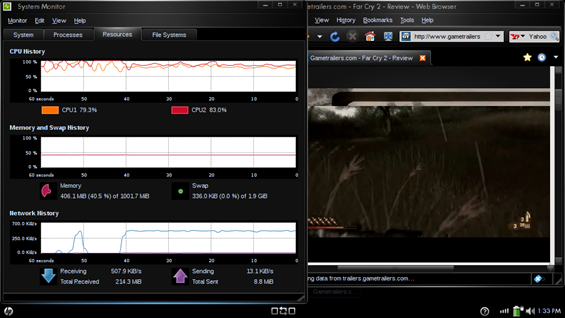 In the screenshot above (click to enlarge) I showed the CPU usage graph while playing back a flash video from Gametrailers.com. This is SD footage. Flash HD video playback is too choppy for realistic viewing on the Mini 1000 MIE. I wouldn’t expect to be multi-tasking while listening to music through YouTube in the background. The CPU was around 80% usage during playback. All tests are done with no apps open. Open apps will theoretically add a small amount of time to hibernate and standby. It is clear to see that standby is going to be your best option in most cases, offering a pretty quick 5-seconds into standby, and bringing you right back to your home screen in 6 seconds. Startup and shutdown times seem fairly normal, but something is a bit odd with the hibernation times on the Mini 1000 MIE. In general, going into hibernate should take about half as long as shutdown, or at least be equal in its speed. In the case of the Mini 1000 MIE, going into hibernation takes the longest of any of the boot options. A few things could be causing this. Let’s quickly define the difference between hibernation and standby. As the computer enters standby, it keeps all of the important OS files, and any running applications in the RAM, and powers down to a very low-power state, using only enough power to keep the data on the RAM alive. This means that it consumes a little bit of power while it is in standby. Hibernation consumes no power because the RAM data is backed up to the HDD (in this case, an SSD), and the computer shuts down completely. When turning back on, the data is rewritten to the RAM from the HDD, and the unit returns to the same exact state that was saved when it went into hibernation. Now that we know a bit about standby vs. hibernate, let’s theorize. One potential cause of poor hibernation times is a bottleneck in communication between the RAM and the SSD. Another reason could be due to the way that Ubuntu handles hibernation. Either way, it is clear that a full shutdown or standby are your best options. In my testing I’ve seen that the Mini 1000 MIE should provide 70 hours of standby time which is pretty good. Put your computer into standby and come back 7 hours later, and you’ll only be missing 10% of your battery life. Considering you are only 6 seconds away from a full computing experience, I’d say that is a pretty good deal. The battery on the Mini 1000 MIE is pretty darn slim. Take a look at the photos above. The computer itself says that the 3-cell battery will power it for 2 hours and 35 minutes from a full charge. The netbook is good at delivering this amount of time while you are using the computer for web browsing. While not available just yet, a 6-cell battery should be available from HP in the near future. Keep an eye on their accessories page for availability. As I mentioned, the non-standard OS doesn’t allow us to run our usual benchmarking programs, but the XP flavored Mini 1000 has been benchmarked by others, I’ll drop the SSD benchmark below, but also swing by this page to see some additional ones. 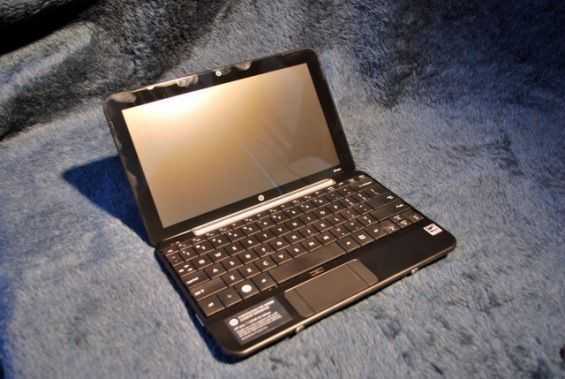 Check out the HP Mini 1000 MIE coverage roadmap for more coverage on this netbook. HP has a mini flash-based site dedicated to the various versions of the Mini 1000 [Portal page]. There is a section dedicated to each edition (MI, XP, and Vivienne Tam). If you roll your mouse over the “Mini 1000 Mi Edition” button and click “Read the Blogs“, you’ll see that the Mini 1000 MIE coverage from ultra mobile PC Portal is being aggregated on the mini site as well as some other sites that are testing out the Mini 1000 MIE. Check out content from several different sites to get an understanding of the device from several different angles. I’m writing this post for target users of the Mini 1000 MIE[link]; those that might not have done a RAM upgrade before. And of course anyone who might be Googling “how to open the RAM door on the mini 1000” because it is just a little bit tricky. Shut down the HP Mini 1000. 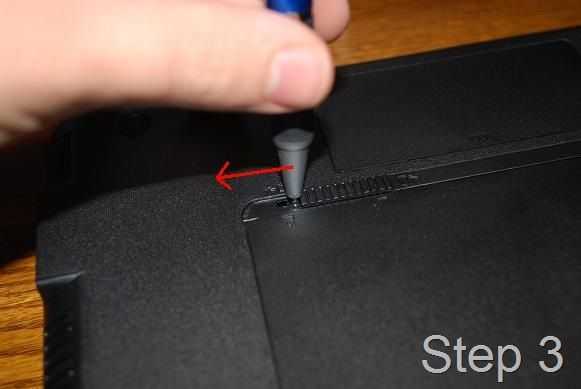 Flip the computer over (you might want to rest it on something soft so that the top of the screen lid can’t get scratched). 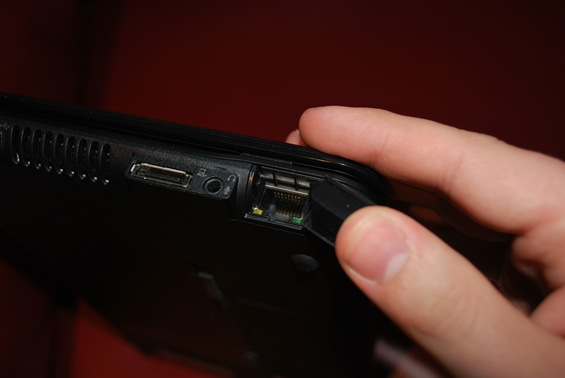 Slide the battery eject latch to the side as though you are unlocking the battery for ejection. Underneath the latch you just slid to the right (if oriented like the images), you will see a small plastic piece underneath with a circle in it. Insert your pen into the circle (right the right) and slide it to the left to pop the RAM door. 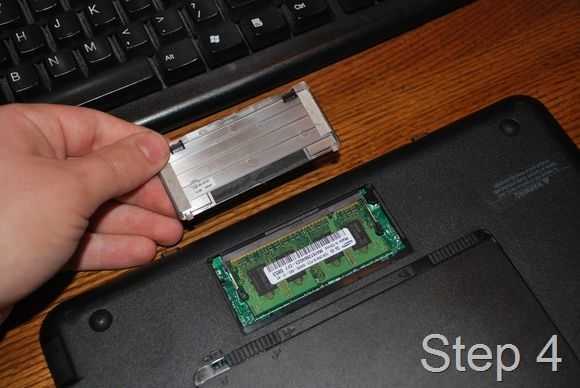 Hold the slider to the left with your pen while you get a grip on the RAM door, and remove the RAM door. Release the spring latches that hold the RAM in place (one of the left and one on the right). The RAM should pop up on the front side. 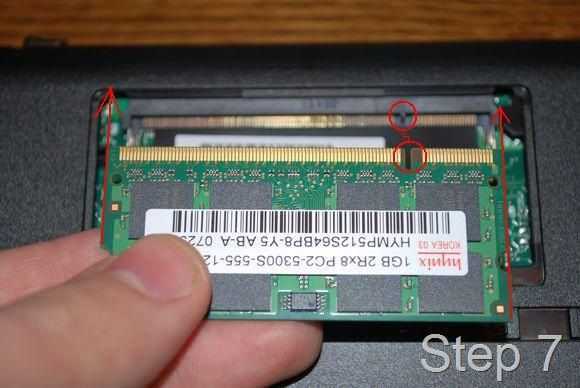 Gently remove the RAM by pulling it out in the direction that it is pointing (the angle it makes with the bottom of the netbook). 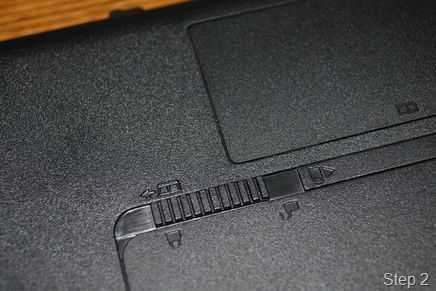 Line up the single notch with the notch in the netbook and insert the new RAM at the same angle that you inserted it. Press down on the RAM evenly to allow the spring latches to take hold of it. Put the RAM door back in place and slide the first latch back into a lock position. That’s it! You’re all done. Easy right? Turn your Mini 1000 on and it should be ready to go. If it doesn’t boot up correctly, it is possible that the ram isn’t sitting quite right. Just pull it out and re-insert it and try again. 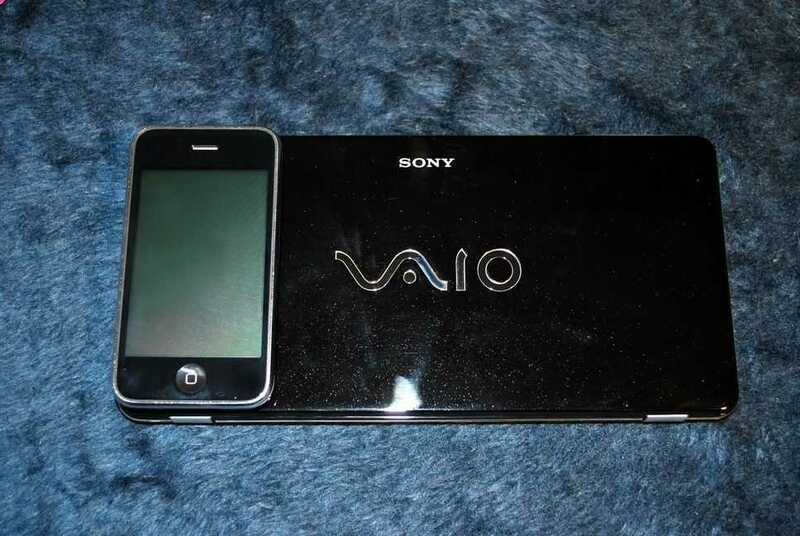 Sony VAIO P – HSDPA mod â€” Tnkgrl of tnkgrl Mobile, has managed to unlock the VAIO P’s EVDO only 3G to allow for HSDPA as well; all it took was a $1 part and a bit of hacking. Dell officially launches Inspiron Mini 10 in France â€” The Inspiron Mini 10 has been officially launched in France. Still looking forward to trying one of these out for the unique buttonless trackpad and the high resolution monitor. Acer Aspire One AOD150 now shipping in the US â€” Acer’s second generation netbook is now on sale in the US and for only $350! We liked the first one and are hoping that this one will live surpass the quality of the first. 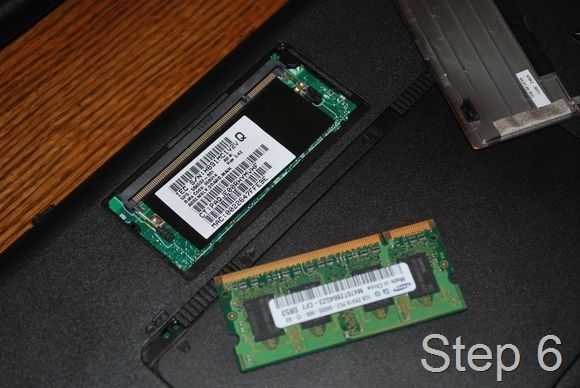 SSD Test: RunCore Mini PCI-e SATA SSD for Asus Eee PCs â€” Jkk does a video test of RunCore SSDs for Eee PCs and sees some pretty impressive speeds. Remember though, these aren’t blindingly fast and super-expensive, but rather have a good price:speed ratio. HP Mini 1000 accessories â€” Brad from Liliputing points us to an HP Mini 1000 [Portal page] site with accessories available for the Mini 1000. A few things are available to order today but the VGA adapter and Mobile Mini Drive still aren’t available yet. Check out our Mini 1000 MIE coverage here. Sony Vaio P battery life: Standard vs. Extended â€” Jenn of Pocketables.net continues here thorough coverage of the VAIO P with tests of the 2- and 4-cell batteries. Click through for a full chart featuring the length that the batteries lasted while running different tasks. While the 2-cell battery probably won’t satisfy your daily computing needs, the 4-cell managed to last just over 6 hours browsing the web (with one hour of that taken up by playing a flash video). You’ve probably seen my initial software impressions of the HP Mini 1000 MIE [Portal page]. Now it’s time to take a look at the hardware that makes the Mini 1000 so attractive. The Mini 1000 is actually quite small. Have a look at a size comparison picture. Opening up the Mini 1000’s lid reveals an impressively large keyboard. Not only are the keys nearly the size of a full blown laptop, but they also have good feedback and look very nice as well. The letting is a perfect snow white, opposite the majority color of the Mini 1000. The graphic letters on the letter keys themselves are printed very large and are easy to see, great for people who can’t quite type without looking down at the keyboard. For some reason the font on all of the other keys is very small and minimalist (example: the shift key); not too small, but certainly not making use of the space on the key. 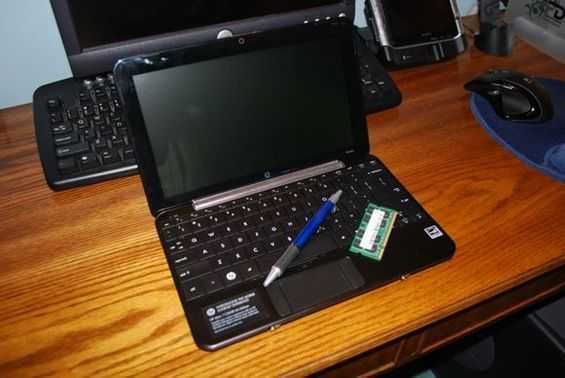 The board stretches from one end of the netbook to the other, utilizing all the space available to it, which is why they managed to fit such a large keyboard on a small netbook. The keyboard as a unit is not reinforced well from the bottom and will bend if you push down on the center of the board. If you aren’t trying however, you won’t notice this, that is just a build quality note. Visually the Mini 1000’s keyboard might be very pleasing, and it also manages to have a lot of real estate, so you’d think it would be a great keyboard right? Well… not quite. Before I get started here let me say that the keyboard is very good, the best of any I’ve tested on a netbook so far. But, it might be a little bit different then what you are used to. I am used to a full sized desktop keyboard which has keys that stick up pretty high. The Mini 1000’s keys actually appear to be larger than those on my desktop keyboard. However, they are very flat and there is very little space between them. Imagine the seams on a concrete sidewalk. You know how each square of sidewalk runs right into the next one? That is very similar to the way that the keys on this keyboard are set up. I am a pretty fast touch-typer, I don’t need to look at my keyboard to type. One of the strategies that makes this possible is being able to feel the space between keys, and the edges of keys to determine where the next key lies. You can’t do that on the Mini 1000’s keyboard because keys are so flat and close together. This isn’t a huge problem though; it is easy to adjust to it after a short period of time, but you might notice it if you are very productive with a normal desktop keyboard. For the target audience of the Mini 1000 MIE it probably isn’t an issue at all, as they will be coming to the unit with little touch-typing experience. The trackpad is decent in size, and it is mostly personal preference when it comes to liking your mouse buttons at the bottom of your trackpad, or on the side. When they are positioned on the side, like they are on the Mini 1000, it seems to imply that you are to navigate the mouse with one hand and click the buttons with another. I personally like to be able to do both with one hand, so mouse-buttons on the side are not the ideal setup for me, but for Mini 1000 MIE target customers, this would probably work well because it allows them to easily use two hands to operate their computer instead of just one. It is also a space-saving design decision to cut down on the size of the palm-rest and the overall footprint of the computer. 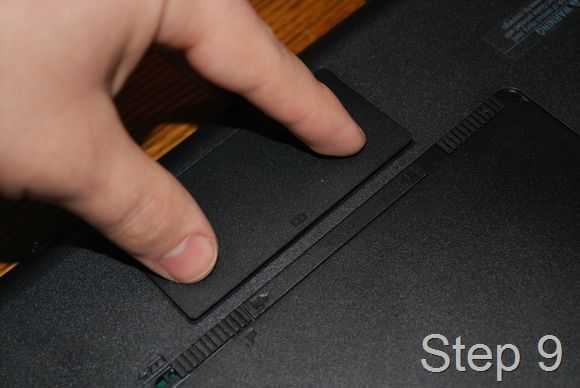 There is a handy button above the trackpad which disables it. This is a nice feature when you are trying to do some serious typing. It is easy to accidentally move the cursor with your palms if you are typing quickly. The Mini does a good job at finding a good design theme and sticking to it. No part of the device seems out of place, and the most complex and attention drawing part of the computer (the hinge) is subtle and stylish, which I think is a good description of the computer as a whole. Stay tuned for my extended hardware and software impressions and more coverage of the HP Mini 1000 MIE. See the HP Mini 1000 MIE coverage roadmap.